Makita angle grinders repair their own hands. The famous Japanese brand Makita popular among consumers all over the world. All products of the brand Makita allocated high quality, ergonomics, affordable prices. A competent Russian consumer is trying to squeeze out of the tool longer, than he can give. Makita LBM have their ultimate strength. Makita grinders repair their own hands is not particularly difficult, and can be implemented as a service center, and independently, because you can freely purchase the necessary spare parts. Faults grinders and their solutions are discussed in detail in the attached instructions. Bulgarian - this angle grinder, It got its name only in the former USSR. structurally, any angle grinder (UŞM) the same structure. The principle of operation is based on the Bulgarians Makita electric energy transformation into mechanical. This leads to a rotation of the shaft, on which you install the drive for cutting, resurfacing, polishing. And it is called a corner for the reason, that the torque is transmitted to the gearbox used at an angle of 90º. Since the cooling of the motor in Makita grinder ensured by the suction of external air through the vents, Bulgarians working parts Makita covered with a special protective lacquer powder, prevents dust from settling. Constructively Makita grinder provided labyrinth seal system and sealed the button "Start". But each firm to attract a buyer embeds into the design of their highlights. Is not deprived of these and Bulgarian Makita. Makita grinders are divided into small and powerful. Makita grinders are labeled according to the power of the electric motor. The presence of the labyrinth device, protects bearings from dirt and dust. The windings of the motor in the high power grinder protected armored coating. Makita Angle grinders are equipped with a special system, protecting the tool from jerking during start-up, called Super-Joint-System. A few words about SJS system. The system prevents the effects of kickback, eliminates jerks and jamming working body, protects the motor against overload. Makita grinders are divided into classes according to the size of the working width of the disc. Grinders are divided into three classes: lungs, average, severe. In turn, Each class is divided into grinders for professionals and for domestic use. In professional models bolgarok Makita increased power reserve, integrated security system, an increased working life. Professional grinders perfectly withstand high loads for a long time. Household Makita angle grinders machines have high performance, but very affordable prices. We Bulgarians Makita disc can be used with a maximum diameter 230 mm. Diameter 230 mm characterizes the Bulgarian heavy class. 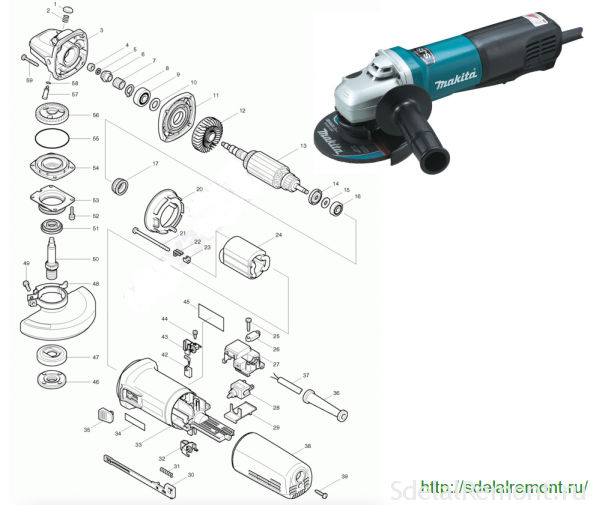 In this class, Makita grinders are available exclusively for professionals. These machines are designed to work on concrete, stones, brick, etc.. all modern consumer protection from injuries incorporated in their design. Models are available for Makita grinder disc diameter 115 mm, 125 mm, 150 mm, 180 mm 230 m.
At high power grinder provided for replacing the carbon brushes without removing the cover of the stator housing. Makita grinders of different capacities vary in appearance. Have a professional Bulgarians capacity over 1000 Tue large body and comfortable rear handle. The handle is equipped with a protective anti-vibration pads black. Bulgarian power up 1000 W have a convenient enclosure, and which serves as a handle. On Makita grinder mounted quick cover. This design allows you to quickly remove the protective cover. Repair your hands Makita angle grinders, It requires the use of a specific tool. Can not do without a set of screwdrivers. rather, so that they are equipped with ratchet. The best way, use a cordless screwdriver. For repair electrical grinder Makita, You need a tester, Device for determining the short-circuited turns IR 2. And zagotovte spanner, bearing puller, hammer, nastavku soft metal. Well, can not do without the necessary grease, cleaning materials, liquids for washing the old grease. LBM begin repairs with their own hands is necessary to prepare the workplace, install proper lighting. You will need a diagram of angle grinders desired model and offers instruction. Any malfunction of power tools are divided into two types: electrical and mechanical. 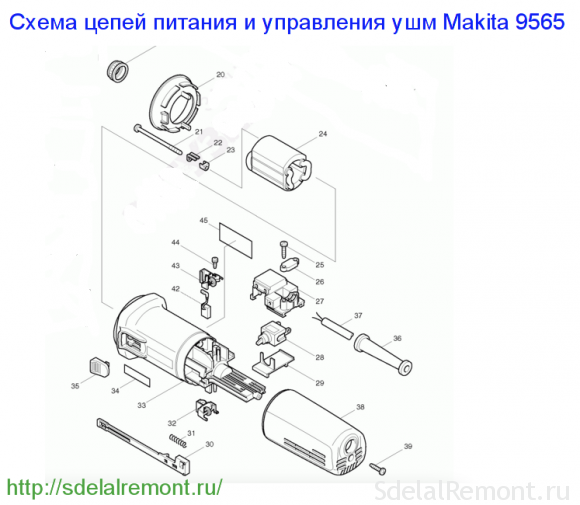 Consider repairing knots grinder Makita angle grinders will be the example of the circuit Makita 9565. Electrical faults Makita grinder can be divided into control circuits malfunction, breakage of the rotor and stator fault. If your bolgarkaMakita not included, greatest cause of failure can be in the power and control circuits. To get to the components of the control circuits, it is necessary to remove the back cover housing poz.38, removing the self-tapping screws 4 × 18 poz.39. Switch ST115-40 K9565 pos.28 mounted in the holder poz.27 switch. switch holder cover is closed poz.29, which is attached to the motor housing poz.33. To switch suitable power cable poz.37. When aid tester circuits check the continuity of a contact plug to the terminals of the switch. Switch lever pos.28 controlled poz.30. From the switch contacts, check the chain to the carbon brushes poz.42. The control circuits are the weakest part of the carbon brushes. The Makita grinder 9565 carbon brush applied CB-318 automatic shut-off,so check brushes. Speed ​​Controllers are installed in a professional grinder. The grinder Makita power more 1000 W capacity for the soft-start system. Such a system equipped LBM Makita 9077SF. At failure of the breaker failure is eliminated its complete replacement. In case of breakage or damage to the power supply wiring fault is corrected by replacing the entire wire or removing damaged parts. The process of switching is performed by means of the lever poz.30. If you've seen the Bulgarian housing for repair or maintenance, before assembly grease grooves silicone grease moving lever. Also in the control circuit diagram grinder includes a rotor and stator. These are complex assemblies, Repair is recommended that you carry out in specialized centers. But for Russian craftsmen inaccessible nothing. We recommend their ways to repair the stator and the rotor with your hands. On failure of the stator grinder poz.24 indicates burning odor, overheating of the Bulgarian housing, spontaneous set speed grinders. In the grinder housing poz.33 stator mounted four self-cutting screws 4 × 70 poz.21. To prevent injury to, stator closed protection poz.20. 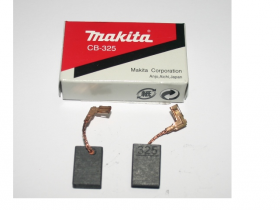 Repair stator grinder Makita is to define a short circuit or breakage of the windings. It is best to perform a diagnosis of the stator by a special device, called IR-2. 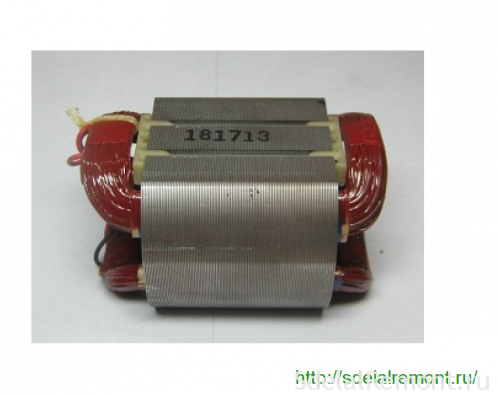 The stator is defective, if there are traces of browning winding, defined breakage or short circuit of windings. repaired stator simply. It is necessary to rewind the motor winding. In case of overheating grinders, burning smell, increase sparks in the collector area should pay attention to the integrity of the rotor pos.13. Dismantling of the rotor is associated with execution of sequential disassembly. 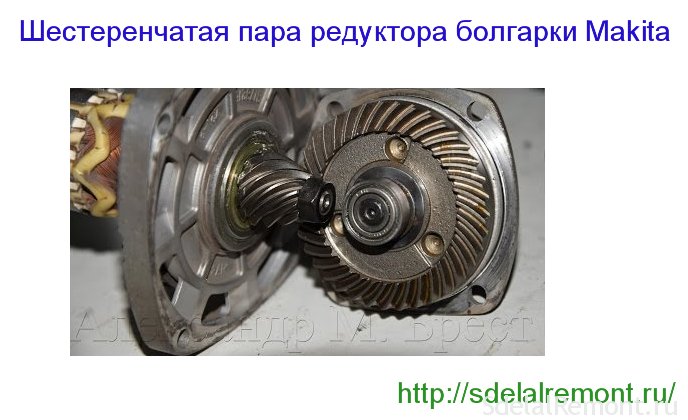 To remove the rotor, it should be exempt from pos.3 gear. To do this, unscrew the hex nut M6 pos.4. To unscrew the nut, should be one-handed clamp rotor. second hand, by means of a spanner, unscrew the nut counterclockwise. Remove the nut, remove the flat washer pos.5, remove the tapered helical gear pos.6, remove the retaining spring pos.7. Shaking rotor side gently pull it out of the gear housing pos.3. After removing the circlip pos.8, using puller sneak bearing pos.9. The Makita grinder 9565 Bearing applied 6001LLB. It remains to remove the flat washer pos.10 and pos.11 cover gear. Before the search appearance rotor grinders Makita 9565 with a plastic insulating washer pos.14, flat washer 7 poz.15, bearing pos.16 and rubber bellow 22 poz.17. The grinder used by the collector bearing 627zz. Russian analogue 80027.
rotor repair is to replace it with a new or refurbished. 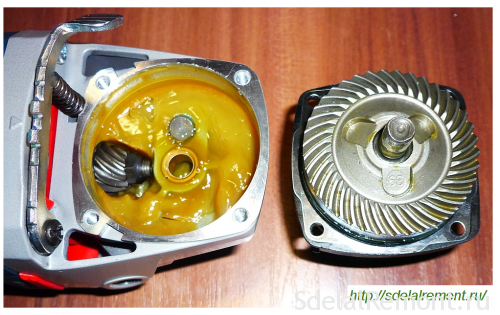 Repair the rotor can be independently and, but we need not only patience, equipment, material. This kind of high-class work. In addition to electrical and mechanical grinders included part, the master node which is a reducer. 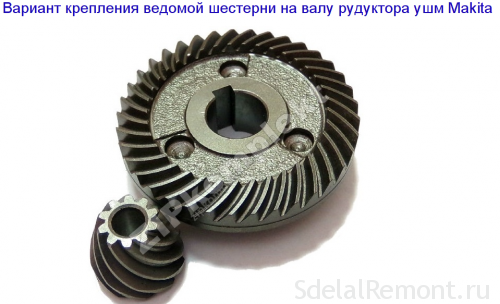 Reducer consists of a body, the driving and driven gears. The pinion gear is fitted on the rotor shaft. The driven gear is mounted on the spindle poz.50. 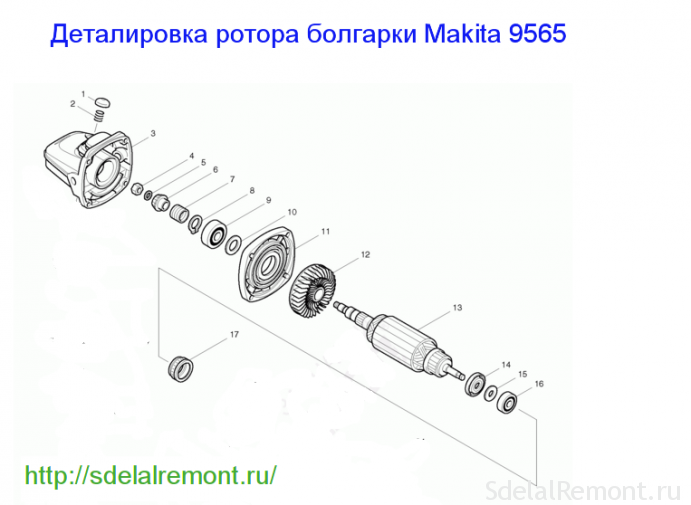 For Makita from Bulgaria 9565 driven gear is pressed onto the spindle. A grinder in Makita 9558HN model driven gear mounted on the shaft with keyway. Faults gear associated with the failure of gear teeth. Gears licks or chipped off of the teeth. gear grinders Makita repair is to replace a pair of helical gears. Replacement gears only in pairs. To remove the driven gear can not do without a press or a special stripper. Do not use a hammer, because the gear housing is made of brittle material. Before assembly, Makita grinder, check the integrity of all parts, their purity. The assembly begins with the installation of the bearing shaft and the driven gear. On the spindle is put anther poz.50 poz.51, poz.53 housing cap, poz.54 bearing housing. The bearing housing insert pre-lubricated bearing 6201LLB. Fit the driven gear poz.56. on the spindle. The spindle is assembled. 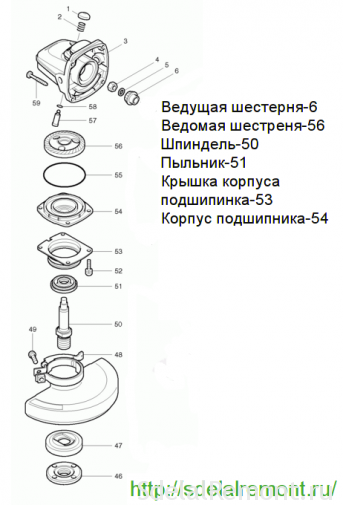 Refurbished or new rotor bearing insert with put in gear housing, nadevaete, according to the drawing, all details, skewer leading gear and lock the nut. In the process of the rotor in the gear housing monitor pressing-bearing. Properly installed easily rotor rotates in the gear housing. The stator casing is inserted into the assembled gearbox with a rotor, which is crimped to the bearing by collector, closed protective rubber bellow, and checked the ease of scrolling. It remains to establish the assembled spindle gear housing. The collected paste into the spindle gear housing pos.3, pre paving rubber ring poz.55 and lubricated bolts sealant poz.52. All assembly operations are accompanied by mechanical grinders mandatory grease parts. Pay special attention to the process of laying the lubricant in the gearbox grinders. It is important not only for its quality, but the number of. The Bulgarian gear case lubricant is placed in the volume 1/3 reducer volume. By bringing the mechanical part grinders, each time before tightening the fixing screws, check the gear ease of rotation, by turning it over the spindle. At the final stage it remains to establish the carbon brushes, put on a case back to check instrument performance. The Makita grinder 9565 CB-325 installed carbon brushes. Timely replacement of carbon brushes not only retain the rotor, but also extend the life of the entire instrument. Usually, carbon brushes are changed after 7000 hours prior to or during wear 8 mm length. In eq Stren cases, you can use homemade carbon brushes. But at the first opportunity it is necessary to establish a family. If your Bulgarian after assembly works without extraneous noise, without jerks, You are to be congratulated. The problem of repair grinder Makita performed. 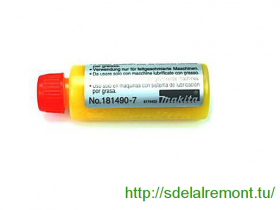 In the Russian market found fakes often bolgarok tool company Makita. Popular and popular brand is popular not only among users, but also different kinds of crooks. Most often subjected to forging strong Bulgarian company Makita. for example, Makita 9069.
armature winding and the stator at imitations covered with lacquer handicraft. Being careful when choosing a grinder Makita, you will not be plucked on a fake and will get a real tool of Japanese manufacturers. Video: Makita rope that. Repair grinders Makita 9565CV .